The data in this Report represent the best available estimates from various national authorities, international agencies, and private sources at the time the Report was prepared. It is possible that some data will have been revised or updated by the sources after publication. The following notes provide sources for all the indicators listed in the Economy Profiles. The title of each indicator appears on the first line, preceded by its number to allow for quick reference. The numbering is consistent with the one adopted in Appendix A. Below is a description of each indicator or, in the case of Executive Opinion Survey data, the full question and associated answers. If necessary, additional information is provided underneath. In this year’s edition, missing values and reported values older than 2007 have been estimated by the authors for the purpose of calculating the Global Competitiveness Index. 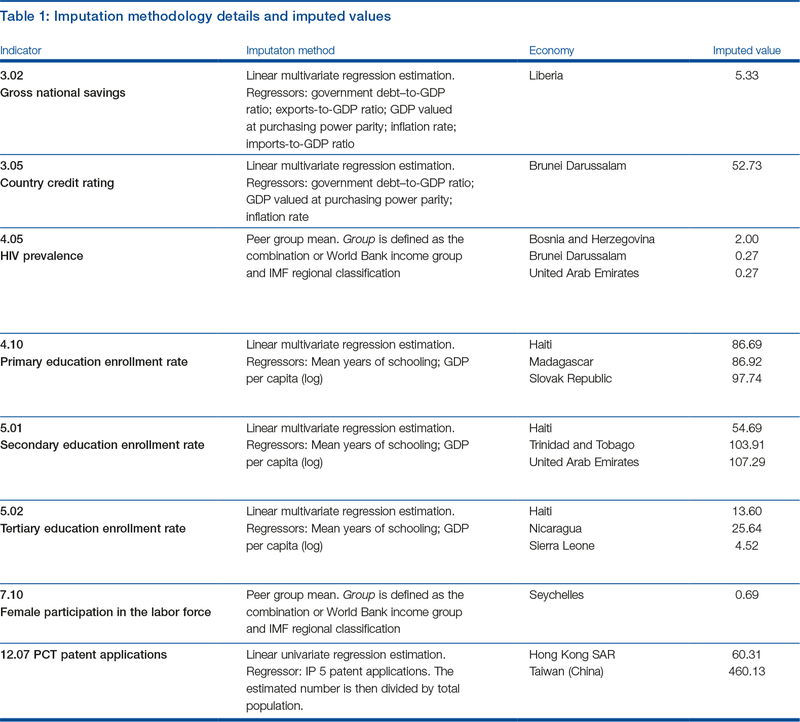 Depending on data availability, these values have been imputed by using either a multivariate linear regression or income-regional group means. The multivariate linear regression method substitutes missing values by the predicted values obtained from estimating a regression. The dependent variable of the regression is the indicator hosting the missing value, and the regressors are other indicators showing a high degree of correlation and conceptually linked with the dependent variable. Imputation using the income-regional group mean method replaces missing values with the sample mean. This sample is determined by the region and the income group to which the economy of the missing value belongs. Table 1 at the end of this appendix reports the imputed values by indicator and economy, and the method used. Note that in the ranking tables available online at http://gcr.weforum.org, imputed values are not reported. This variable is a combination of the Extent of disclosure index (transparency of transactions), the Extent of director liability index (liability for self-dealing), and the Ease of shareholder suit index (shareholders’ ability to sue officers and directors for misconduct). For more details about the methodology employed and the assumptions made to compute this indicator, visit http://www.doingbusiness.org/methodologysurveys/. N/Appl. is used for economies where there is no regular train service or where the network covers only a negligible portion of the territory. Assessment of the existence of a network was conducted by the World Economic Forum based on various sources. This indicator measures the total passenger-carrying capacity of all scheduled flights, including domestic flights, originating in a country. It is computed by multiplying the number of seats available on each flight by the flight distance in kilometers and summing the result across all scheduled flights in a week. The final value represents the weekly average for the year (Jan–Dec), taking into account flights scheduled beforehand by airline companies. Mobile-cellular telephone subscriptions refers to the number of subscriptions to a public mobile telephone service that provides access to the public switched telephone network (PSTN) using cellular technology. It includes both the number of postpaid subscriptions and the number of active prepaid accounts (i.e., that have been active during the past three months). It includes all mobile-cellular subscriptions that offer voice communications. It excludes subscriptions via data cards or USB modems, subscriptions to public mobile data services, and private trunked mobile radio, telepoint, radio paging, and telemetry services. Fixed-telephone subscriptions refers to the sum of active analogue fixed-telephone lines, voice over IP (VoIP) subscriptions, fixed wireless local loop (WLL) subscriptions, ISDN voice-channel equivalents, and fixed-public payphones. It includes all accesses over fixed infrastructure supporting voice telephony using copper wire, voice services using Internet Protocol (IP) delivered over fixed (wired)-broadband infrastructure (e.g., DSL, fiber optic), and voice services provided over coaxial-cable television networks (cable modem). It also includes fixed wireless local loop (WLL) connections, which are defined as services provided by licensed fixed-line telephone operators that provide last-mile access to the subscriber using radio technology, when the call is then routed over a fixed-line telephone network (and not a mobile-cellular network). In the case of VoIP, it refers to subscriptions that offer the ability to place and receive calls at any time and do not require a computer. VoIP is also known as voice-over broadband (VoB), and includes subscriptions through fixed-wireless, DSL, cable, fiber optic, and other fixed-broadband platforms that provide fixed telephony using IP. General government budget balance is calculated as general government revenue minus total expenditure. This is a core Government Finance Statistics (GFS) balance that measures the extent to which the general government is either putting financial resources at the disposal of other sectors in the economy and nonresidents (net lending), or utilizing the financial resources generated by other sectors and nonresidents (net borrowing). This balance may be viewed as an indicator of the financial impact of general government activity on the rest of the economy and nonresidents. Revenue consists of taxes, social contributions, grants receivable, and other revenue. Revenue increases a government’s net worth, which is the difference between its assets and liabilities. General government total expenditure consists of total expenses and the net acquisition of nonfinancial assets. Gross national savings is expressed as a ratio of gross national savings in current local currency and GDP in current local currency. It corresponds to gross disposable income less final consumption expenditure after taking account of an adjustment for pension funds. For many countries, the estimates of national savings are built up from national accounts data on gross domestic investment and from balance of payments-based data on net foreign investment. For this indicator, some values were imputed. See Table 1 at the end of this appendix for details. Gross debt consists of all liabilities that require payment or payments of interest and/or principal by the debtor to the creditor at a date or dates in the future. This includes debt liabilities in the form of special drawing rights, currency and deposits, debt securities, loans, insurance, pensions and standardized guarantee schemes, and other accounts payable. Thus all liabilities in the Government Finance Statistics Manual (GFSM) 2001 system are debt, except for equity and investment fund shares, financial derivatives, and employee stock options. For Australia, Belgium, Canada, Hong Kong SAR, Iceland, New Zealand, and Sweden, government debt coverage also includes insurance technical reserves, following the GFSM 2001 definition. Institutional Investor’s Country Credit Ratings™ developed by Institutional Investor are based on information provided by senior economists and sovereign-debt analysts at leading global banks and money management and security firms. Twice a year, the respondents grade each country on a scale of 0 to 100, with 100 representing the least chance of default. For economies that: (1) were declared free of malaria by the World Health Organization (WHO) (except in the case of Hong Kong SAR, for which malaria assessment is from the CDC); (2) are included in the WHO’s supplementary list of areas where malaria has never existed or has disappeared without specific measures; or (3) are currently in the prevention of reintroduction phase as identified by the WHO, this indicator is excluded from the calculation of the GCI. In the Economy Profiles of these economies, the following abbreviations are used: M.F. for malaria-free economies; P.R. means the economy is in the prevention of reintroduction phase; and S.L. means the economy is on the WHO’s supplementary list. For economies that are considered free of malaria; that are included in the World Health Organization’s supplementary list; or that are in the prevention of reintroduction phase (see indicator 4.01 above), this indicator is excluded from the calculation of the GCI. In the Economy Profiles of these economies, N/Appl. is used for this indicator. HIV prevalence refers to the percentage of people aged 15–49 who are infected with HIV at a particular point in time, no matter when infection occurred. Note: Economies with a prevalence rate equal to or less than 0.2 percent are all ranked first and listed alphabetically. Infant mortality rate is the number of infants dying before reaching one year of age per 1,000 live births in a given year. The reported value corresponds to the ratio of children of official primary school age (as defined by the national education system) who are enrolled in primary school. Primary education (ISCED level 1) provides children with basic reading, writing, and mathematics skills along with an elementary understanding of such subjects as history, geography, natural science, social science, art, and music. The reported value corresponds to the ratio of total secondary enrollment, regardless of age, to the population of the age group that officially corresponds to the secondary education level. Secondary education (ISCED levels 2 and 3) completes the provision of basic education that began at the primary level, and aims to lay the foundations for lifelong learning and human development by offering more subject- or skills-oriented instruction using more specialized teachers. The reported value corresponds to the ratio of total tertiary enrollment, regardless of age, to the population of the age group that officially corresponds to the tertiary education level. Tertiary education (ISCED levels 5 and 6), whether or not leading to an advanced research qualification, normally requires, as a minimum condition of admission, the successful completion of education at the secondary level. The total tax rate measures the amount of taxes and mandatory contributions payable by a business in the second year of operation, expressed as a share of commercial profits. The total amount of taxes is the sum of five different types of taxes and contributions payable after accounting for deductions and exemptions: profit or corporate income tax, social contributions and labor taxes paid by the employer, property taxes, turnover taxes, and other small taxes. For more details about the methodology employed and the assumptions made to compute this indicator, visit http://www.doingbusiness.org/methodologysurveys/. For details about the methodology employed and the assumptions made to compute this indicator, visit http://www.doingbusiness.org/methodologysurveys/. An applied tariff is a customs duty that is levied on imports of merchandise goods. This indicator is calculated as a weighted average of all the applied tariff rates, including preferential rates that a country applies to the rest of the world. The weights are the trade patterns of the importing country’s reference group. Total imports is the sum of total imports of merchandise and commercial services. This variable estimates the cost of advance notice requirements, severance payments, and penalties due when terminating a redundant worker, expressed in weekly wages. For more details about the methodology employed and the assumptions made to compute this indicator, visit http://www.doingbusiness.org/methodologysurveys/. This measure is the percentage of women aged 15–64 participating in the labor force divided by the percentage of men aged 15–64 participating in the labor force. Source: International Labour Organization, Key Indicators of the Labour Markets, 9th Edition. This index measures the degree to which collateral and bankruptcy laws protect borrowers’ and lenders’ rights and thus facilitate lending. For more details about the methodology employed and the assumptions made to compute this indicator, visit http://www.doingbusiness.org/methodologysurveys/. Individuals using the Internet refers to people who used the Internet from any location and for any purpose, irrespective of the device and network used, in the last three months. It can be via a computer (i.e., desktop computer, laptop computer or tablet, or similar handheld computer), mobile phone, games machine, digital TV, etc. Access can be via a fixed or mobile network. Fixed (wired)-broadband subscriptions refers to the number of subscriptions for high-speed access to the public Internet (a TCP/IP connection). Highspeed access is defined as downstream speeds equal to, or greater than, 256 kbit/s. Fixed (wired)-broadband includes cable modem, DSL, fiber, and other fixed (wired)-broadband technologies—such as Ethernet LAN, and broadband over powerline (BPL) communications. Subscriptions with access to data communications (including the Internet) via mobile-cellular networks are excluded. International Internet bandwidth refers to the total used capacity of international Internet bandwidth, in megabits per second (Mb/s). It is measured as the sum of used capacity of all Internet exchanges offering international bandwidth. If capacity is asymmetric, then the incoming capacity is used. International Internet bandwidth (kb/s) per Internet user is calculated by dividing the capacity in Mb/s by a thousand and dividing it by the total number of Internet users. Active mobile-broadband subscriptions refers to the sum of standard mobile-broadband subscriptions and dedicated mobile-broadband data subscriptions to the public Internet. It covers actual subscribers, not potential subscribers, even though the latter may have broadband-enabled handsets. Standard mobile-broadband subscriptions refers to active mobile-cellular subscriptions with advertised data speeds of 256 kb/s or greater that allow access to the greater Internet via HTTP and that have been used to set up an Internet data connection using Internet Protocol (IP) in the past three months. Standard SMS and MMS messaging do not count as an active Internet data connection, even if the messages are delivered via IP. Dedicated mobile-broadband data subscriptions refers to subscriptions to dedicated data services (over a mobile network) that allow access to the greater Internet and that are purchased separately from voice services, either as a standalone service (e.g., using a data card such as a USB modem/dongle) or as an add-on data package to voice services that requires an additional subscription. All dedicated mobile-broadband subscriptions with recurring subscription fees are included regardless of actual use. Prepaid mobile-broadband plans require use if there is no monthly subscription. This indicator could also include mobile WiMAX subscriptions. Total exports is the sum of total exports of merchandise and commercial services. This indicator measures the total count of applications filed under the Patent Cooperation Treaty (PCT), by priority date and inventor nationality, using fractional count if an application is filed by multiple inventors. The average count of applications filed in 2013 and 2014 is divided by population figures for 2014. For more details about the treatment of Hong Kong SAR and Taiwan (China), refer to the imputation methodology described at the beginning of this section. Sources: Organisation for Economic Co-operation and Development (OECD), Patent Database, (situation as of July 2017). For population data: International Monetary Fund,World Economic Outlook Database (April 2017 edition); World Economic Forum’s calculations.